An asterisk attached to the Village Voice's praise for Richard Lipsky: what about the contradictions? The Village Voice's Best of NYC 2009 issue honors Richard Lipsky as the Best Small-Business Lobbyist. Lipsky the lobbyist is usually found on the steps of City Hall: He's the guy in the suit, with a shock of dark hair and a brush mustache gone gray, talking nonstop into a cell-phone device in his ear. In a city where lobbyists get paid big bucks to whisper quietly to influential politicians, Richard Lipsky will have none of it. He barks, bellows, and bites. When handed the microphone at a rally, he's as good a rabble-rouser as an irate Bronx tenant. This is not how lobbyists are supposed to do business, but Lipsky has long gone his own way. Victims who can attest to the sharpness of his bite include the likes of Wal-Mart—defeated three times in its bid to find sites for giant local box stores. Another un-lobbyist-like tool is his nonstop blog—cloyingly dubbed "momandpopnyc.com" [actually momandpopnyc.blogspot.com]—which regularly takes journalists to task on subjects ranging from Israel to school testing. He may also be the only lobbyist now working City Hall to hold a Ph.D., which he sometimes can't help showing off: His blog posts often include words like "avidity"—which he knows the press corps will have to look up. WTF? Can't the Voice look beyond his SAT words--words the press should know--and consider the contradictions: NYC Lobbyist Search shows (click on graphic to enlarge) Lipsky working for Willets Point United and Tuck-It-Away, which are fighting eminent domain in Willets Point and West Harlem, respectively, while working for the Atlantic Yards Development Company and Forest City Ratner, which are hoping to gain from eminent domain in Prospect Heights. And while Lipsky is fighting big box stores, he's helping ease them in while working for FC East River Associates, which is developing East River Plaza in East Harlem. 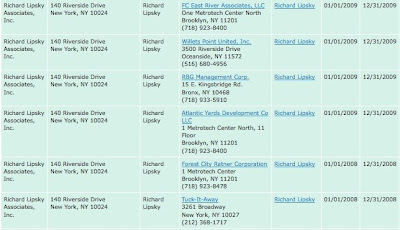 With a startling lack of irony, Richard Lipsky (who was paid by Forest City Ratner to promote Atlantic Yards) cites Mayor Bloomberg's support of eminent domain for Atlantic Yards (via Steve Malanga's City Journal piece) as an example of how bad Bloomberg has been for small businesses — which represent the lion's share of Lipsky's client base.